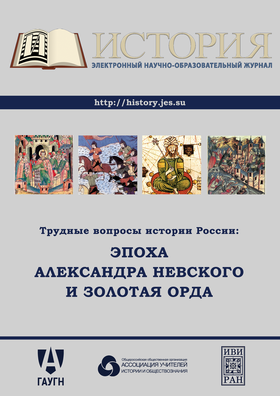 The given science-methodic manual examines the period of Alexander Nevsky, when along with the personality of the duke, the corps of chronicle sources, which gradually built the heroic image of Nevsky, is analyzed. The Duke’s activity is incorporated by the author into the context of the events, which took place in the wide territories including the Russian principalities, the Golden Horde, the Grand Duchy of Lithuania, Kingdoms of Sweden and Norway. The author of the methodic manual reviews the whole complex of the international relations, typical for that period. The given manual contains the wide list of sources, literature and a special part with multiple exercises on the subject.